Hangzhou is a renowned tourism destination in east China, but it is also a must-visit place for Buddhists from all over the world. Buddhism was introduced to Hangzhou during the Eastern Jin Dynasty (317-420) and flourished in the Southern Song Dynasty (1127-1279). Most of Hangzhou's Buddhist temples, some dating back more than 1,000 years, are hidden in the mountains west and south of picturesque West Lake. The temples have long been venerated venues for renowned monks to disseminate Buddhist teaching and culture among believers and the general public. Lingyin Temple, founded in 326, is the earliest Buddhist site built in the city and has since given in name to the general area, which is known to locals simply as Lingyin. Legend has it that a renowned monk from India - birthplace of the religion - who gave himself the Chinese name Huili paid a visit to Hangzhou to search for future temple sites. As he passed through the Lingyin area, he was deeply impressed with the surrounding misty mountains, regarding it an ideal place for study and meditation. 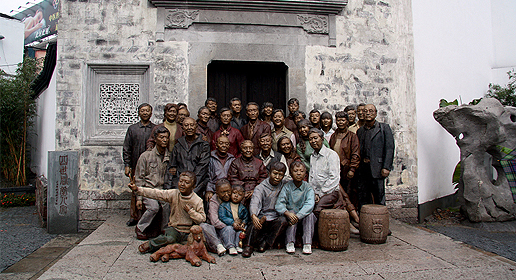 Huili then founded the Lingyin Temple, still considered one of the top 10 Buddhist temples in China and the largest south of the Yangtze River. 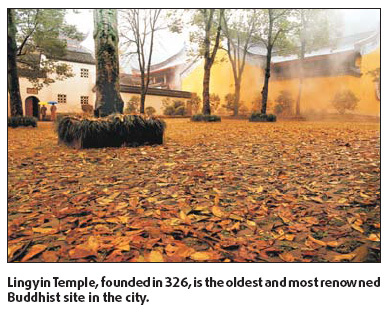 Huili also began nine other temples, with Lingyin, Lingshun and Yongfu the best preserved today. In the years following Huili, other temples were built by noted Buddhist monks, including the Jingci, Upper Tianzhu, Middle Tianzhu, Lower Tianzhu and Taoguang sites. Located to the south of West Lake and built in 954, Jingci is second-largest Buddhist temple in Hangzhou. In addition to temples, the Feilai Peak grottoes with 340 statues completed in a period spanning the 10th to 14th centuries draw Buddhists from nations the world over. 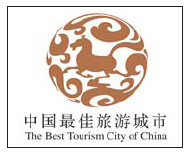 The Hangzhou city government implemented a massive project in recent years to renovate the city's major temples and other places of interest. A new Buddhist culture and arts institute will be completed in May and open to the public in September. Buddhists and others who are interested will have the opportunity to participate in a number of programs at the institute, including a range of classes such as Buddhist theory, study of its painting and sculpture, and cultural exchanges. 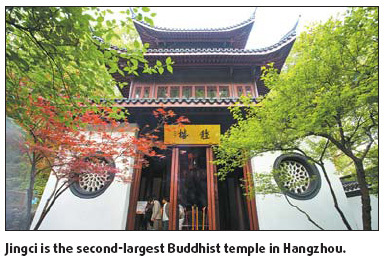 Hangzhou's top eight temples received a total of 5.66 million visitors last year.